The Electro-Voice ZXA1-Sub powered subwoofer gives you an excellent, articulate active sub in an extremely portable design. Overall, it is surprisingly light and powerful for its 700-watt power rating. 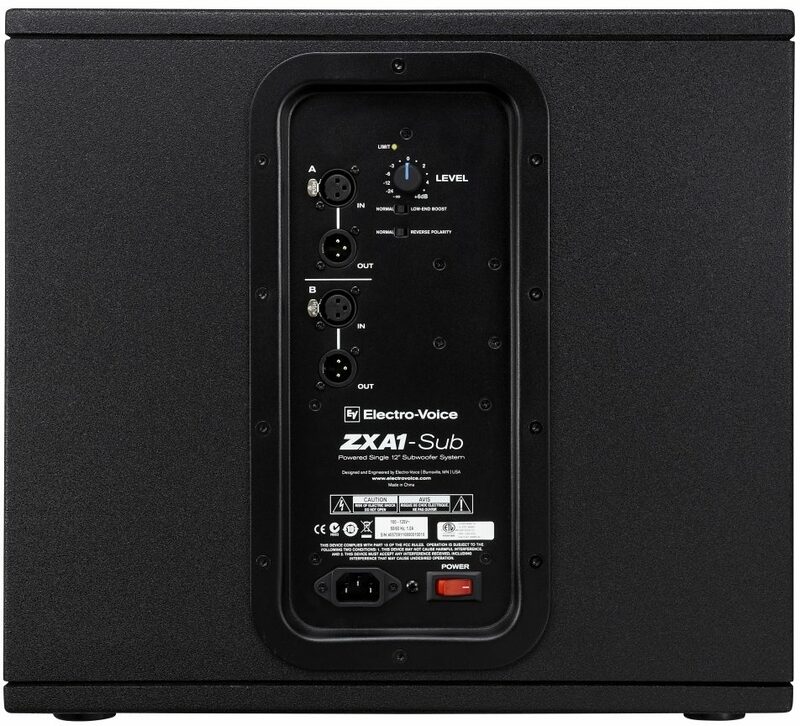 Measuring less than 16 x 18 x 18 inches, and weighing in under 50 pounds, the ZXA1-Sub subwoofer still manages to deliver 700 watts of room-shaking power. It does this largely with its use of a cleverly designed Class D amplifier inside, which cuts down on the weight of the circuitry and also runs cooler and more efficiently. The EV ZXA1-Sub's 9-ply 15 mm wood cabinet is uniquely designed to faithfully reproduce your low-end frequencies without getting "boxy" sounding when you push the volume to the limit. The excellent amplifier inside the ZXA1-Sub, running through the single EVS-12S 12-inch woofer, delivers a bass tone that is clearly defined and retains the tonal detail that you've spent your time crafting. An impressive maximum SPL rating of 126 dB makes it one of the more efficient amps for its size and weight as well. The controls on the ZXA1-Sub are totally straightforward. It has 2 x XLR balanced stereo inputs, as well as 2 x XLR balanced stereo outputs. It has its own Volume Level knob on the back panel. It can be run in Normal or Bass Boost modes. A handy Polarity Switch knob is also provided here. Overall, the ZXA1-Sub was voiced and designed to be the perfect complement to your full-range Electro-Voice ZXA powered speakers. But if you want to integrate its tone with a pre-existing speaker rig, it'll serve well in any situation where you need a 700-watt subwoofer to hold down the low end. It's got an integrated handle to make lugging it around easy, and a built-in pole mount when you want to get it off the ground in a full-range setup. - Dimensions (H x W x D): 15.7" x 17.50" x 18.00"
The ZXA1-Sub is designed to provide the ultimate combination of portability, performance, and power in a lightweight, stylish, small-format package. 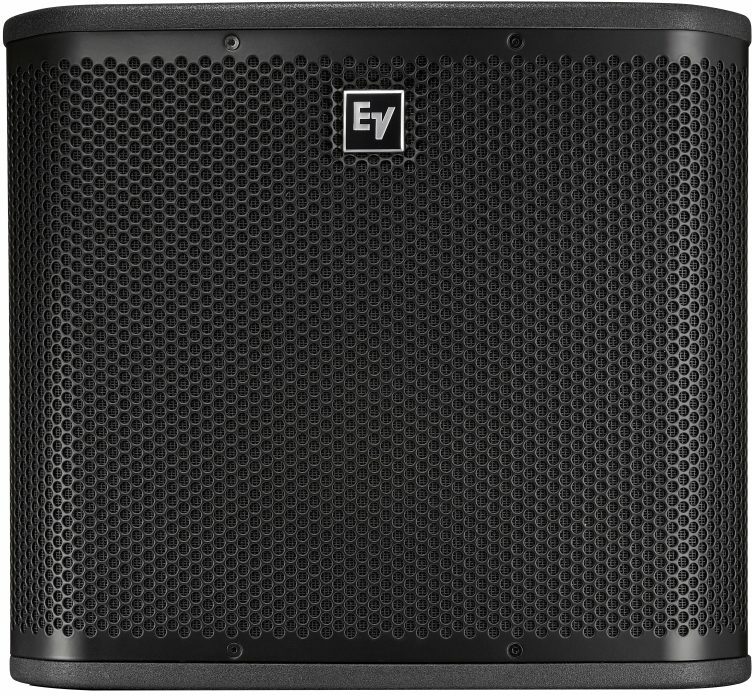 Though equipped with a heavy-duty EV-engineered woofer, a state-of-the-art 700-watt amplifier, a durable 15-mm wood enclosure, and a maximum SPL rating of 126 dB, the ZXA1-Sub weighs-in at just 46 lbs and sports a trim 15.75 x 17.5 x 18 inch profile. Add easy-to-use controls and connectivity to the equation and a ZXA1-Sub makes enhancing a compact sound system with professional-quality low-end easier than ever. 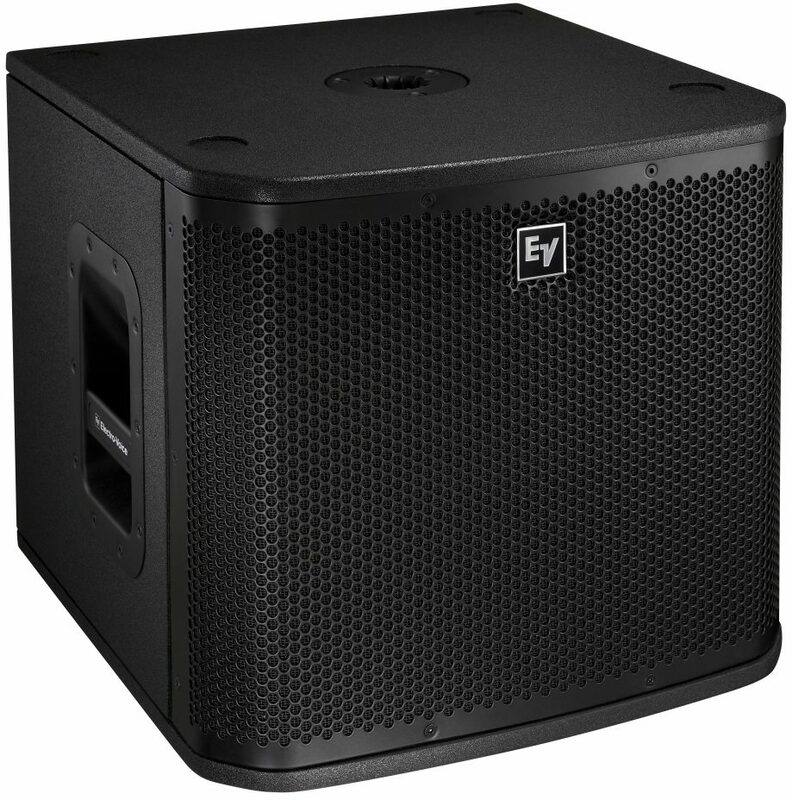 "Just enough Bass for any event"
Sound: Sound is delivering a great deep bass punch adding that bass where it's needed at. Ease of Use: So easy to use, plug your xlr's in and play. Simple to use Quality: What I liked the most was the rubber feet on the bottom of the sub, it stayed where it needed to be. It gripped the floor very nicely. Value: Very welled priced, affordable for a mobile dj Manufacturer Support: Haven't had the need to call them. Which is a good thing. The Wow Factor: Very light weight. It fit well in the back of my cab of my truck. For the size of this small speaker, it delivers beyond expectations Overall: I just purchase this sub to enhance my EV ZXL 15p's. A big thank you to ZZounds for a quick delivery. They arrived the morning of a huge graduation party I had to do and they sounded great. I did a sound check before the guest arrive just to hear the base and it was superb. Also it kept my tops very cool by adding a sub. Not once did I clip and I rocked a full 6hr gig. "Great Low End Enhancement Without Breaking Your Back"
Sound: The sound was exactly what I was looking for. When doing private functions at buildings where multiple events are occurring, I'm often asked by planners and building reps to make sure the bass wouldn't bleed into adjacent rooms. Knowing this, I wanted to add low end that would enhance my sound setup, not rattle dentures from the mouths of the elderly. The ZXA1 gave me said low end, and now the audiophile in me can't remember what life was like prior to buying this sub. Feature: 2 XLR IN/OUT, polarity invert and boost.–your typical subwoofer features. The one non-electrical feature that I appreciate the most is the weight. This thing is cake to carry and travel with, yet still packs a punch. Ease of Use: Great sounds are easy to obtain. As you long as you have basic knowledge of gain structure, you will achieve a great end result. Quality: Built like a brick, light as a feather. Doesn't feel cheap by any means. I don't see it falling apart anytime soon. A lot of times you get what you pay for, but this subwoofer truly feels like I've gotten more than what I paid for, ten fold. Value: As previously mentioned, at this price it's a STEAL. You want find a better sounding sub in this price bracket. Period. Manufacturer Support: Haven't had to deal with them, but based on my research those who have had to deal with them have enjoyed nothing but positive outcomes. The Wow Factor: Honestly, the warm bass emitted from this baby really brings the live mix as a whole together nicely. I was taken back but just how amazing it sounds and have no regrets about abandoning the QSC sub purchase. Overall: I was looking to add some low end to my current setup (QSC K12's) and was on the cusp of buying QSC's subwoofer. Price wasn't really an object. My concern was sound and weight. After doing my research, the name I kept encountering was "ElectroVoice." I figured I'd roll the dice and, worse case scenario, I return it to zzounds.com if I didn't like. Needless to say, the ZXA1 has found a permanent home with me. 80 of 82 people (97.56%) found this review helpful. Did you?